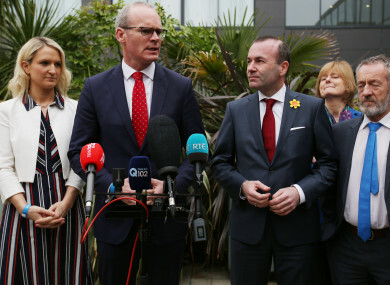 Pictured (LtoR) Minister of State Helen McEntee, Tanaiste Simon Coveney, and the next President of the EU Commission, Manfred Weber. THE MAN WHO is tipped to be the next president of the European Commissioner, Manfred Weber, has said the UK needs to give Brexit clarity before the European elections. The leader of the European People’s Party (EPP) downplayed the possibility of any long Brexit extension, and questioned how the UK could be permitted in taking part in the European elections in May. If the Brexit date gets pushed out, Britain would have to elect MEPs. This would cause a major headache to other EU countries, including Ireland, who have gained seats after the reallocation of the UK’s seats in Europe. Ireland was allotted the additional two seats as part of the redistribution of seats due to UK’s vote to leave the European Union. Irish European election candidates elected in the South constituency and the Dublin constituency will not be able to take up their seats in the European Parliament until the UK has left the EU. This means that two Irish MEPs elected in this year’s European Parliament elections, despite Ireland being assigned an extra two seats. Weber told reporters at the Fine Gael National Conference today that the UK “uncertainty” now has the potential to “infect European decision-making process”. Tánaiste Simon Coveney said the Irish government has legislated for either scenario if Brexit happens with a deal or without. If a further extension is sought by the UK, they might not get it, said Coveney. If significant more time is sought “they would have to face EU elections”. “There are a lot of voices who will not accept that Great Britain will participate in the elections, I myself I must tell you I cannot explain to people in Spain, Greece, in Finland or even here in Ireland that a country that is leaving the European Union formally has a big say in the future of the European Union, that is a big question on the table,” said Weber. Email “If UK seek long extension, they'll have to run candidates in European elections, says Coveney”. Feedback on “If UK seek long extension, they'll have to run candidates in European elections, says Coveney”.